A book set mainly in Italy and so well described I felt I was there, out in the sun, enjoying the countryside, having coffee in the gardens of the hotel. Sofia has come there after her father dies. She’s been his carer for many years, he left Italy when he married her mum and never returned though he talked of home with such love, and she promised him she’d live her own life after he died, and delivering a family message gave her Italy as a start to that. She’s spending time there, so takes a live in position as waitress and befriends Amy. She’s another young waitress, left home after a family fallout and Sofia feels protective of her. She’s concerned at the attention one of the guests, who is much older than Amy, is paying to her. Its one of those stories that starts simply, Sophia going to Italy as her father wanted, but quickly involves others and their lives and actions become entwined in the story. There are lots of surprises, some deliciously heated romance, and some hard decisions for Sophia to make. It looks like a simple read, but like Sue’s other stories its far more complex than it appears, having multi-layered plots that spread and encompass many characters. I loved Sophia and Levi, though like her I wondered why he was so interested in Amy. Amy was a typical older teen, dramatic and thinks everything revolves around her, but she’s a naive girl, good hearted and hard working even if she has run away from home in a hissy fit. She did have some particularly shocking revelations thrown at her. 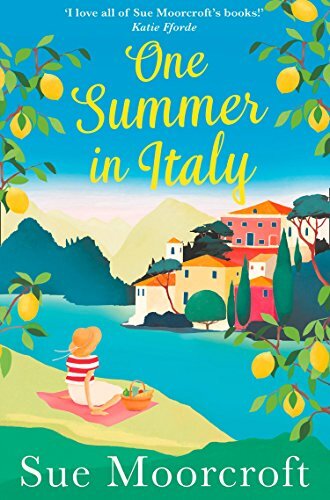 I enjoyed this story, its not heart stopping drama, a can’t-put-down read, but one that’s fun for a summer’s day in the hammock, or to take on holiday, to the beach, and get lost in Italy along with the characters. I don’t think its one I’d re-read, but it is one I really enjoyed. Stars: Five, a great fun read, perfect to take on holiday or to lose yourself for a few hours.